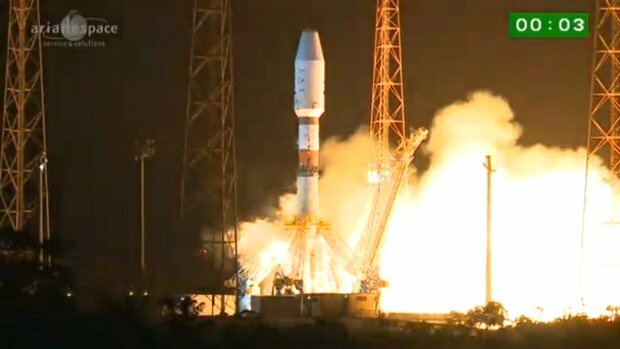 The Gaia spacecraft was launched a little while ago on a Soyuz-STB rocket with the optional Fregat-MT third stage from the European Spaceport in Kourou, French Guiana. After a little more than 40 minutes Gaia successfully separated from the last stage to move towards its destination. The name Gaia was originally an acronym for Global Astrometric Interferometer for Astrophysics but from the original project, proposed in 1993, the techniques of interferometry initially planned for the observations became outdated. The Gaia project has its roots in the ESA Hipparcos mission, which lasted from 1989 to 1993. The Hipparcos (High precision parallax collecting satellite) satellite was the first experiment of precision astrometry which surveyed more than 100,000 stars. The purpose of the Gaia spacecraft is to create a high-precision three-dimensional map of over a hundred million stars in the Milky Way and to survey billions of other celestial objects, not only stars but also galaxies. This result will be obtained by repeatedly measuring the positions of all objects up to magnitude 20, that is 400,000 times fainter than those visible to the naked eye. In the five-year period of its mission, Gaia will be able to determine precisely the position and motion of stars relatively close to Earth. This accuracy will gradually decrease proportionally to the distance of the stars and other celestial objects but the data will still be extremely useful. The Gaia spacecraft will carry out its mission in a Lissajous orbit, around the point known as L2. It’s a Lagrangian point about 1.5 million km away from Earth. In that area Gaia will have a better view of the cosmos than in Earth orbit, where it would go in and out of the planet’s shadow. Once it reaches that area, Gaia will deploy a “skirt” with a diameter of just over 10 meters which will shadow the two telescopes that will be used for the observations also allowing their temperature to drop below -100 degrees Celsius. Its bottom is partly covered by solar panels that will always point toward the Sun to generate the electricity needed for the Gaia and its instruments to work. The launch of the Gaia spacecraft was scheduled for November but a problem with a transponder of a satellite already in orbit of the same type as those mounted on Gaia forced a last minute decision to postpone the launch. The transponders, which generate the timing signal for the downlink of telemetry data, have been replaced. The observations of Gaia will also be used to help the search for exoplanets but results are expected also for objects much closer to us. In fact, the probe will also look for asteroids and comets in the solar system. Its main task is to help astronomers better understand the dynamics of the evolution of the Milky Way but there’s also the task of discovering potentially dangerous objects.